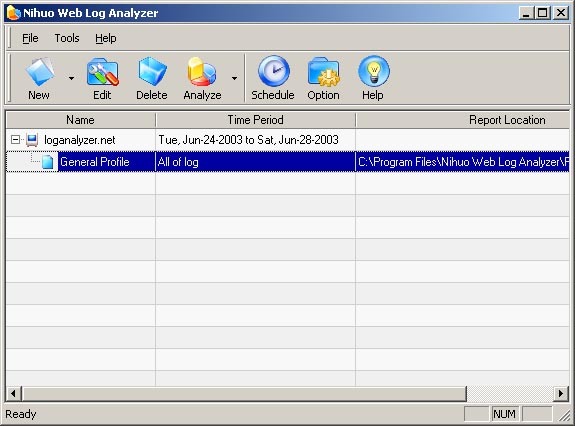 Nihuo Web Log Analyzer is a fast and powerful web access log analyzer for small and medium size websites. By telling you where your web site visitors come from, which pages are most popular, and which search engine phrases brought visitors to your web site, you can make your site a more effective sales machine. With Nihuo Web Log Analyzer you can create your own custom reports or tailor standard reports to meet your specific needs. ...... Nihuo Web Log Analyzer is highly configurable. With Nihuo Web Log Analyzer you can create your own custom reports or tailor standard reports to meet your specific needs. * Server report for load balanced servers ratio. Qweas is providing links to Nihuo Web Log Analyzer for Windows 4.01 as a courtesy, and makes no representations regarding Nihuo Web Log Analyzer for Windows or any other applications or any information related thereto. Any questions, complaints or claims regarding this application Nihuo Web Log Analyzer for Windows 4.01 must be directed to the appropriate software vendor. You may click the publisher link of Nihuo Web Log Analyzer for Windows on the top of this page to get more details about the vendor.